To celebrate the return of Roy of the Rovers , the National Literacy Trust and Rebellion are inviting pupils aged 8 to 12 to get creative and write a club motto for Roy Race’s iconic football team, Melchester Rovers. Publishers Rebellion have rebooted the legendary Roy of the Rovers comic for the 21st century to help inspire new generations of children to fall in love with reading through football. As part of Rebellion’s commitment to children’s literacy, the publisher has already donated 10,000 Roy of the Rovers graphic novels and illustrated fiction books to National Literacy Trust Hubs around the UK. This competition is the natural next step for Rebellion’s burgeoning partnership with the charity. Using exciting excerpts and illustrations from the new books, the National Literacy Trust has created a range of free teaching resources and activities, including top tips from author Tom Palmer, to help pupils write a motto that encapsulates Roy Race’s passion for football, celebrates the team spirit of Melchester Rovers and inspires fans. 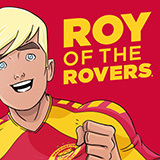 Teachers will also receive a free Roy of the Rovers poster for their classroom and bookmarks for pupils. Tom Palmer, author of the new Roy of the Rovers chapter books, said: “Roy of the Rovers helped me discover a love of reading. I might be a reader and writer now, but I wasn’t when I was at school. I was intimidated by reading. I feared it. But all that changed when I started reading about the only thing I cared about at that age – football. Roy Race quickly became my football hero. He didn’t give up. He faced challenges head on. When things went wrong, he would find a solution, not just blame others. And he scored great goals!